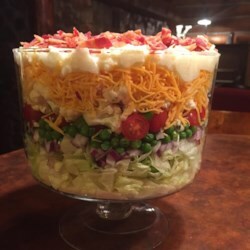 In a large flat bowl, place the chopped lettuce and top with a layer of onion, peas, shredded cheese, cauliflower and bacon. Prepare the dressing by whisking together the mayonnaise, sugar and Parmesan cheese. Drizzle over salad and refrigerate until chilled.